The path to a college basketball national title is often cleared at some key juncture by Dame Fortune. A bounce here, a break there, and a future champion on the brink of elimination is saved. By the time the tourney is over and the Final Four nets have been trimmed in April, the luck that launched the run often is forgotten. If Duke wins it all this year, nobody should ever forget the fickle escape against Central Florida on Sunday. “We were lucky,” Blue Devils coach Mike Krzyzewski acknowledged right after the game to CBS sideline reporter Tracy Wolfson. The legendary coach added that he’s been both unlucky and lucky in the tournament before, and the memory of last year’s Grayson Allen shot that wouldn’t fall to beat Kansas in the regional final likely was on his mind. A similar roll on the last shot Sunday went K’s way, to the eternal angst of Central Florida. The overall No. 1 seed and massive ratings magnet received a large shipment of good fortune just in time to survive a fierce UCF effort. It was a few years’ worth of blessed March karma, all of it compressed into the final two minutes of what was easily the most riveting game of what had been a lackluster 2019 tournament. 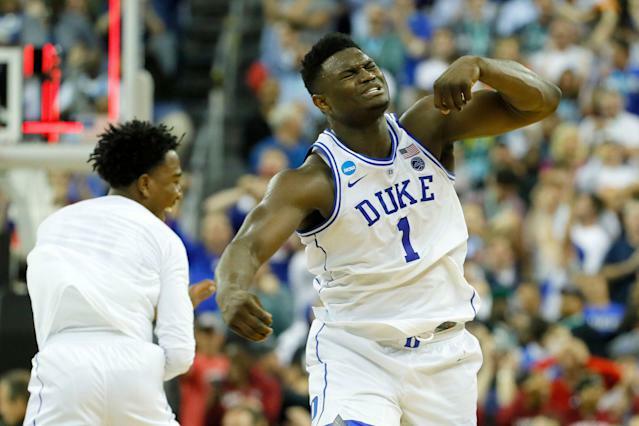 The Blue Devils beat the Knights, 77-76, and continue into the Sweet 16 — but with greater doubts about their title viability and greater optimism for their challengers. * A runout UCF alley-pop to the Knights’ best player, Aubrey Dawkins — who was ridiculously good in this game — passed through his hands for a turnover instead of through the hoop for a six-point lead. * A Dawkins jumper that rattled in and out. * A Zion Williamson drive for a basket that also fouled out 7-foot-6 tower Tacko Fall — a play on which Williamson flirted very hard with fouling out himself when he ran into UCF guard B.J. Taylor in the lane, before driving into Fall. With Fall out, Duke’s RJ Barrett was able to grab the rebound on Williamson’s missed free throw and score what turned out to be the winning basket. * The two UCF misses on the final possession — one on a contested banker by Taylor, the second when Dawkins swooped in for an acrobatic tip-in that could have won the game but somehow crawled along the top of the rim without dropping. Those plays, along with some clutch ones by the Devils, added up to a survive-and-advance triumph in an instant March classic. But what was exposed by UCF coach Johnny Dawkins — who played for and coached alongside Krzyzewski at Duke — could be formidable ammunition for opponents in the coming rounds. The Knights focused the entirety of their defense on Williamson, Barrett and Cam Reddish. Williamson was heroic (32 points, 11 rebounds, four assists, three steals, and so many dazzling baskets when Duke absolutely needed them). The other two contributed key plays while combining for 29 points. But UCF dared the rest of the Blue Devils to do anything, and the dare was incredibly close to working. UCF completely disrespected the shooting ability of point guard Tre Jones, and he couldn’t make the Knights pay for it — Jones was 1-for-8 from the 3-point line, dropping his season percentage to 23.2. UCF treated backup guard Jordan Goldwire the same, and he actually outperformed his 9.1 percent 3-point accuracy by making one of three attempts. Duke big men Javin DeLaurier and Marques Bolden were similarly impotent offensively, combining to score two points. Now, it’s true that the Knights were uniquely qualified to play this way, thanks to the massive paint impediment that was Fall. But other teams can play a sagging defense that forces Jones and others to make plays. Against that kind of look, Duke needs one more reliable shooter. But Krzyzewski never brought Alex O’Connell (39.5 percent from 3) off the bench, nor did he try junior forward Jack White, a onetime deadly corner shooter whose jumper deserted him two months ago. Playing three-on-five on offense doesn’t seem like a sustainable approach if the goal is winning it all. But here’s the other thing: the assumption all along has been that the best chance of beating Duke was a disastrous 3-point shooting night for the Devils. Well, Duke made 10 threes and shot 40 percent beyond the arc Sunday — and still nearly lost. That’s mostly because Duke’s defense wasn’t very good. UCF made 50 percent of its 18 3-pointers, and Taylor shot 10 free throws, making nine. There are better offensive teams looming in the Blue Devils’ path — from Virginia Tech to Michigan State and beyond — and they’ll likely pick up a few ideas of where to attack Duke’s defense. In the end, winning by a single point is all that matters in tournament basketball. This might have been the life-or-death struggle and great escape that many champions have had to endure. But it might also have been a warning sign that Duke is too flawed to win it all, with tougher competition to come.